The MidWinter Meeting is the primary meeting of the Association and provides a great opportunity to present and discuss research in the broad field of Otolaryngology. 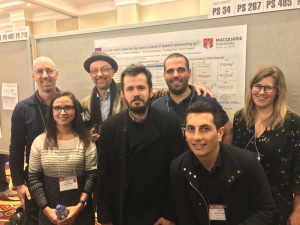 This year’s meeting was attended by nine of Macquarie University’s researchers, including Professor David McAlpine, Andrew Brughera, Dr. Nicholas Haywood, Heivet Hernández-Perez, Dr. Jason Mikiel-Hunter, Dr. Jessica Monaghan, Mathieu Recugnat, Dr. Jaime Undurraga, and Dr. Lindsey Van Yper. The papers presented at the meeting featured research on binaural hearing, cochlear implants, hidden hearing loss, and the efferent auditory pathway. Binaural hearing, particularly the ability to detect small differences in the arrival time of sounds between the two ears (interaural time differences, ITDs), enables sound localization and improves speech perception in adverse listening conditions. Despite the importance of binaural hearing for every-day listening, it is still poorly understood how ITDs are represented in the human brain. To this end, Andrew Brughera proposed a model in which internal delays of brainstem neurons are generated by membrane properties. In addition, Dr. Nicholas Haywood presented his results on psychoacoustic measures to characterize hemispheric tuning of spatial channels. Cochlear implants performance varies considerably between patients. This outcome variability may be explained by individual differences in the electrode-neural interface, as well as differences in higher-order auditory processing. As an invited speaker, Dr. Jaime Undurraga talked about how the electrode-neural interface limits the outcome with cochlear implants. He also presented a poster on the use of objective measures to differentiate electrodes in cochlear implant users. Mathieu Recugnat presented his work on how the polarity and pulse shape effects the auditory nerve responses using a physiologically inspired model of a single spiral ganglion neuron. Dr. Lindsey Van Yper presented a poster on the use of cognitive auditory event-related potentials to assess cochlear implant performance. There is increasing evidence that acoustic noise can engender damage to neural processing in the absence of elevated hearing thresholds (so-called hidden hearing loss). Dr. Jessica Monaghan presented a poster on the changes in the neural representation of speech-in-noise induced by acoustic noise insults in the auditory midbrain of gerbils. The perception of speech sounds in humans requires a fast and accurate integration of both bottom-up and top-down information. However, it remains poorly understood whether during speech perception the top-down control reaches the level of the brainstem or even the cochlea. In her poster, Heivet Hernández-Perez showed that auditory attention indeed modulates the activity of the cochlear activity, brainstem, and cortical responses. After attending the ARO MidWinter Meeting, Professor David McAlpine and his group visited Professor Daniel Polley’s lab at Harvard Medical School where ideas on binaural processing were exchanged.